Hi there, @kduxbury, and thanks for your message! I’m delighted to hear that you enjoy my books. My wife thinks I must have been a Roman soldier in a previous life as well! Please spread the word as much as you can – my books don’t sell well in America at all, sadly. Best wishes to you – Ben. 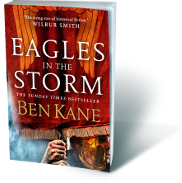 Wow Ben, I have just read the first chapter of “Eagles in the Storm”. What a blinding opener! Thrilled, can’t wait to get my hands on a copy! Hi Monique – thank you, I’m pleased you like it! I hope you enjoy the rest of the book too. Best wishes – Ben. Hi Ben, Greetings from Chile, I already finished the first part of Hannibal and is just fantastic and also I had read the two parts of Spartacus and was amazing, now i’m reading “Eagles at War”. Thank you for your books, I hope to read all of its. Ciao, d.esco.gan! Gracias por tu mensaje. Estoy siempre feliz oyer de un lector nuevo. Saludos – Ben. Hi, Greetings from México, I have read everything you have written that is published in spanish, so first I want to congratulate you on your work, and I would like to ask you when the next book of Hannibal series will be released and when will Eagles in the Storm will be released in spanish. Buenas tardes, Octavio. Muy buen nombre – Romano! Gracias por tu mensaje y palabras amables. No se cuando publicar la proxima novela sobre Anibal – estas novelas no venden como mis otros – es una lastima. Aguilas en la Tormenta saldra mas tarde en 2017. Saludos! Ben. Sorry your books don’t sell well in the US. I just bought a signed copy of Eagles in the Storm at The Poisoned Pen bookstore in Scottsdale, Arizona. Let’s see whether we can turn this sales numbers around! I have just read Eagles in the Storm – what an utterly captivating book, I couldn’t put it down and finished it in record time! Your best book by a mile! Will miss Tullus and his gang though, what great characters! Thanks for the thrilling ride, Ben.